Big Coal Is Bankrupt. Who Will Pay to Clean Up Its Mess? Regulators treated the coal industry like it was “too big to fail.” Now taxpayers and the environment may pay the price. Once a rolling grassland, northeastern Wyoming is now pockmarked with big holes. The Powder River Basin, as the region is known, is home to several of the country’s largest coal mines—giant terraced expanses of exposed earth and rock, much of it dug on federal land. The blasting and scraping altered more than the surface of the landscape: It’s also cut into aquifers, letting water leach away. Still, coal companies have promised they’ll leave the land better than they found it. But as Big Coal collapses, landowners and environmental groups are questioning whether they have enough money to keep that promise, which is also a matter of law, as federal regulation requires companies to restore the land they’ve mined. Alpha Natural Resources and Arch Coal, which operates the basin’s second-largest surface mine, have filed for bankruptcy. Together the two producers have about $900 million of clean up work to do in Wyoming. Peabody, the world’s largest coal corporation, is expected to go the same way soon after its stock fell to just over $2 a share, from a record high of $1,300 in 2008. Peabody’s reclamation obligations total $1.4 billion, including about $800 million in Wyoming. The problem in Wyoming is that the state allowed coal companies to “self-bond” their clean-up responsibilities. Essentially, companies told regulators they had enough money to reclaim their mines, and in turn regulators made a bet that the companies were right, and didn’t require them to pay a third party to ensure that costs would be covered. It’s a kind of subsidy, really, that reduced the financial burden on coal producers (who are heavily subsidized in other ways, too, for mining in the PRB) by 78 cents per ton of coal, according to one report. The problem isn’t unique to Wyoming: Peabody self-bonds its reclamation in Colorado, New Mexico, Illinois, and Indiana, too. “It was always a little bit of a scam, based on the premise that there were mining companies that were ‘too big to fail,’” says Shannon Anderson, at attorney for the Powder River Basin Resource Council, a landowners group. “But now you have the world’s largest mining company on the verge of bankruptcy, so pretty much everything is on the table.” Anderson’s group filed a complaint Monday with the state Department of Environmental Quality and the federal Office of Surface Mining, asking regulators to order Peabody to underwrite its reclamation liability via real bonds. “We’re just trying to get money on the table that’s guaranteed for clean up work,” Anderson explained. Otherwise, the American people could end up paying $3.6 billion to restore land wrecked by Peabody and the rest of the coal crew nationwide. “With the increased financial fragility of many coal mining companies, if they are self-bonded that does potentially leave the states and the taxpayers at risk,” Interior Secretary Sally Jewell acknowledged in testimony to the House Natural Resources Committee in December. When Arch and Alpha went bankrupt, Wyoming officials struck deals with the two companies that commit them to paying for only a fraction of the reclamation work they’re obligated to do. The fate of the mines won’t be clear for several years, but Anderson said that if the state is left with the tab, its likely to do the bare minimum to close up the mines, never mind restoring the grassland or the water systems. 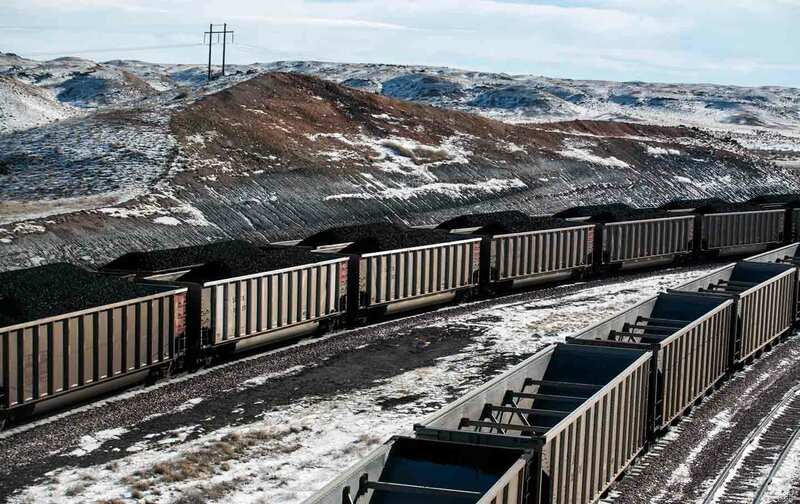 As it stands now, only about 10 percent of the land torn up by coal producers in Wyoming has been reclaimed. Some environmental groups are using the reclamation issue to push Big Coal towards winding down production. “Certainly we want reclamation to happen, and we want to be sure the cost will not fall to the tax payers, but at the end of the day we want coal to be kept in the ground,” says Jeremy Nichols, who directs climate and energy programs for WildEarth Guardians. Coal producers (and even Anderson) argue they need to keep mining in order to pay for future restoration, an argument Nichols calls “completely absurd.” He argues that legally, the companies shouldn’t be allowed to mine since they’re not in compliance with cleanup laws. “If they want to reduce their reclamation cost, they better start reclaiming,” he says, though he acknowledges that Peabody will likely keep mining for years to come. “The question isn’t do we allow them to mine more to pay for cleanup, it’s how do we ensure that as they mine, they take meaningful steps to wind down their operations,” says Nichols. Strip mines stretching across as many as 90 square miles are just part of the damage left behind by coal, of course. The dismantling of the landscape in Appalachia has been far more severe than in the plains of Wyoming, as Jedediah Purdy describes it over at The Atlantic: Five hundred mountains in the region have been destroyed, while countless valleys and waterways have been filled with the rubble. Not everything can be reclaimed. There is the human wreckage—the illness and impoverishment, and all the miners and spouses whose healthcare and retirement security is being sacrificed to fund the bankruptcy process. Meanwhile, Big Coal’s political allies go on using out-of-work miners as political props while ignoring plans to help them. Clearly the discussion about reclamation has barely begun.